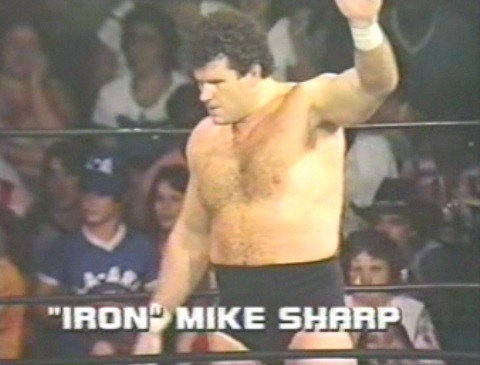 Mid-South Wrestling TV #151 July 31st 1982 – The “Iron” Mike Sharpe Show. It may be 2016 for the rest of us, but back at the Irish McNeil Boys Club it is the summer of 1982 and we’re resuming our look at the run of the historic, “wild and woolly (! )”, Mid-South Wrestling television show. Unfortunately, episode #150 from July 24th has been lost to history so we’re skipping a head one week, but luckily wrestling companies used to explain things every week so if you missed something it was never too hard to find out what happened. As always, Boyd Pierce opened the show with Bill Watts at the desk and that good ol’ country boy, Boyd, ran down the card for the week. Watts went off on a completely irrelevant tangent about how his wife, who was from Estonia, had a bunch of her friends and family over at their house in Bixby, OK. Watts explained that his wife, who he didn’t bother to name, had escaped from a post-WWII camp in Estonia as a child and mentioned that her father passed away at the camp. The point of Watt’s story was that he was so happy to see all these Estonians and other eastern Europeans who had escaped the tyranny of the Soviet Union and were now living in America. That’s right, we got a promo from Bill Watts about the Cold freaking War! Watts went on to say that he, and everyone at Mid-South Sports for that matter, fully supported “President Reagan” in denouncing the Soviet Union and he declared that the USA would never be absorbed into the USSR like those poor unfortunate Estonians. – This was remarkable stuff. Watts finally got onto wrestling and explained that the Junkyard Dog was refusing to wrestle on television again unless it was against Ted DiBiase. Watts added that in return DiBiase was refusing to wrestle JYD, period. – If anyone is interested, Ene Watts (Bill’s wife at the time) used to run the advertising agency for Mid-South before divorcing the Cowboy in 1989. Bill Watts: He don’t like Commies. Non-Title Match: Mr Olympia (Mississippi Heavyweight Champion) vs. Billy Starr. – Olympia over in 3:25. Fairly straight forward enhancement win for Olympia, who you could tell was working at about 60% as he basically walked through his comeback towards the end. Still, a 60% Mr Olympia was pretty great and he won with his vaunted Sleeper. There was one noteworthy spot, as they did the chase around ringside deal, however instead of being cut off like an idiot Olympia foiled the heel and hit a dropkick. – Wrestling used to make sense! “Dr Death” Steve Williams vs. Mike Bond. -Williams over in 3:37. Match was pretty boring, although somebody figured out that Doc was way too green to be doing actual matches at this point and they spent most of the time doing a bunch of amateur spots. The first high spot was a BEAR HUG from Doc. Finish saw Doc hit some chop-blocks and win with Watts‘ old Oklahoma Stampede. Two-on-One Handicap Match: One Man Gang w/Skandor Akbar vs. Joe Stark & David Price. – Gang over in 2:19. Akbar was wearing a neckbrace because “Iron” Mike Sharpe gave him a piledriver last week (more on that later). It may seem bizarre through modern eyes for a heel to be the underdog in a handicap match, but the way this was presented made it clear that these two poor tomato cans had no hope whatsoever against the Gang. It wasn’t very eventful; Gang just beat them up and pinned Price with a Piledriver. It was time for the main event of the show and at the desk, Bill Watts explained the story of “Iron” Mike Sharpe, Skandor Akbar and the Piledriver. The story goes that Akbar paid thousands of dollars to hire a bunch of attorneys to go after kayfabe Mid-South president, Charlie Lay, in order to get the Piledriver, which was an illegal hold, reinstated. – Just think about how awesome that is. So, during the Mike Sharpe vs. One Man Gang match from last week, Gang went to deliver the now legal Piledriver but Sharpe countered. Sharpe ended up giving Skandor Akbar a Piledriver, because, again, wrestling used to be awesome, and this week Akbar was bringing his monster, Killer Khan, for revenge on Sharpe. They showed the footage of all this from last week and the fans were literally jumping up and down with joy when Sharpe gave Akbar the Piledriver. Louisiana Heavyweight Championship: Killer Khan (C) w/Skandor Akbar vs. “Iron” Mike Sharpe. – Sharpe over via DQ at 5:21. Mike Sharpe unfortunately passed away four days ago at the time of writing this, so it is quite the bitter-sweet coincidence that he should be the main focus of this particular episode of Mid-South TV. The match itself wasn’t that good, they just did some mean-guy stuff and Khan got a little heat one Sharpe. Finish was awesome however, as Sharpe went for a Piledriver on Khan, but Akbar ran in to break it up and the referee ended up taking a bump. Sharpe beat the hell out of Akbar and sent Khan over the top rope then he gave Akbar another Piledriver and the fans once again soiled themselves with glee. The referee got back in the ring and declared Sharpe the winner via DQ. – This was the most over Sharpe has ever been during his run in Mid-South and it will be interesting to see how they follow up on the momentum he established after two hot angles. 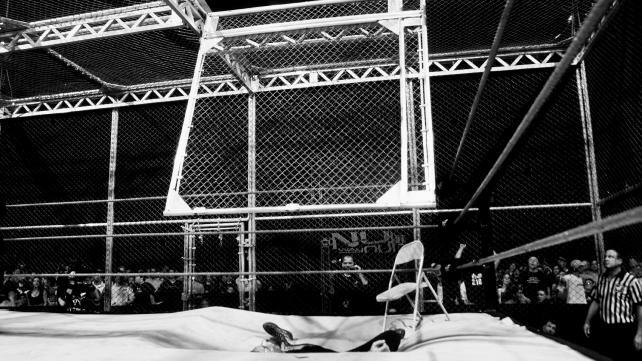 “Hangman” Harris vs. Rick McCord. – Harris over in 2:43. McCord, who would go on to get small, short-lived push for Crockett in 1983, looked like an even younger Buddy Landel with the bleached hair and he moved pretty well compared to the other job guys. His selling however, was horrendous, as his range seemed to be, not selling at all to flopping around on the mat like a fish. Harris won with his goofy Hangman submission hold. 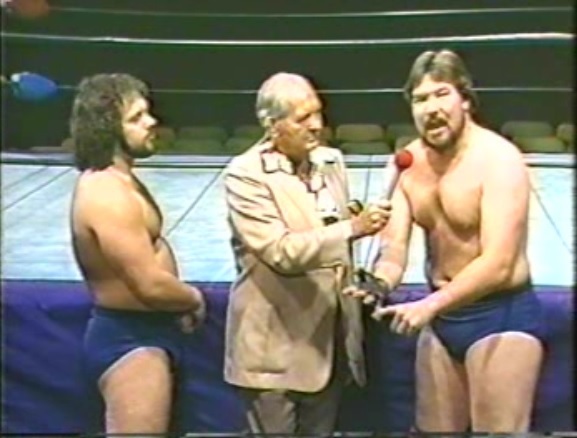 Ted DiBiase (North American Heavyweight Champion) & “Hacksaw” Jim Duggan vs. Jesse Barr & Vinnie Romeo. 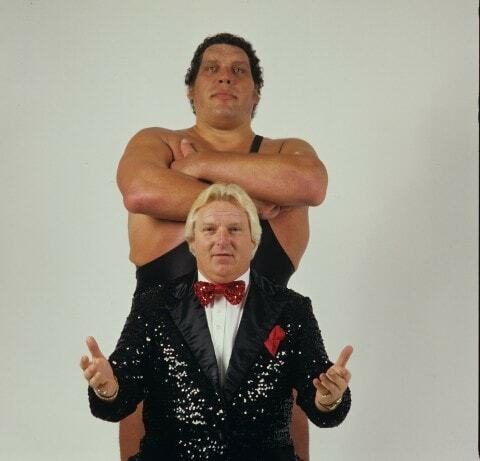 – Basic enhancement win for Duggan & DiBiase in . 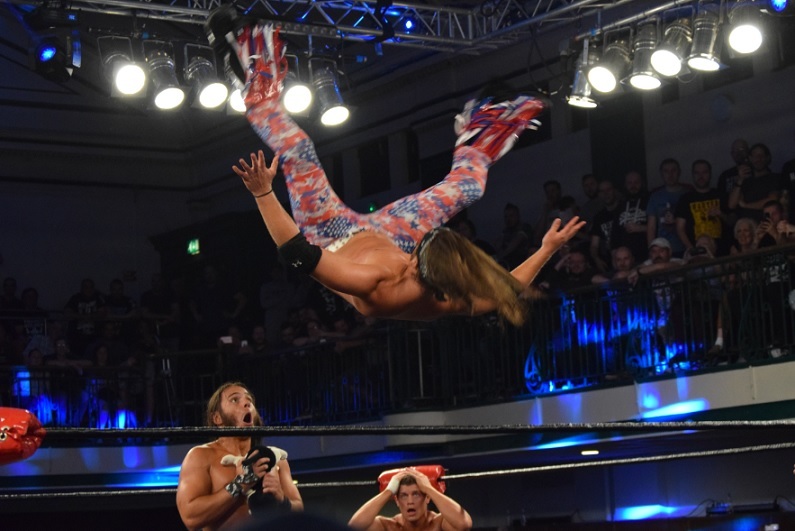 Jesse Barr, who was just above the level of a complete jobber, got the chance to shine on Duggan for a while, but everything went wrong when Romeo tagged in and the heels beat him up with ease. The finish was wacky, as DiBiase, instead of slamming Romeo’s head into the turbuckle, slammed it into Duggan’s head then slapped on the Figure Four while Duggan took out Barr with a flying headbutt like he was Mil Mascaras. – This was essentially the genesis of the Rat Pack, but it will still take a few months before Matt Bourne joins the stable and they really get rolling. 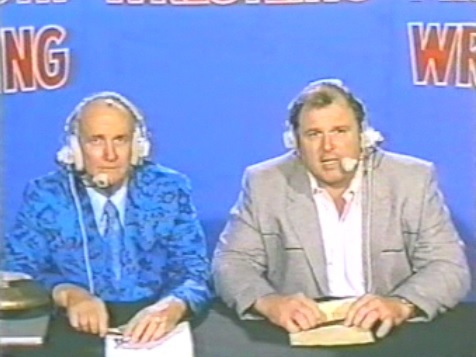 Back with Boyd & Watts at the desk and they showed the finish of Ted DiBiase vs. Buck Robely from last week. Mike Sharpe, Paul Ellering & Mr Olympia were all in Robley’s corner, because babyfaces used to be friends with each other. The time ran out and the match was declared a draw. Buck Robley vs. 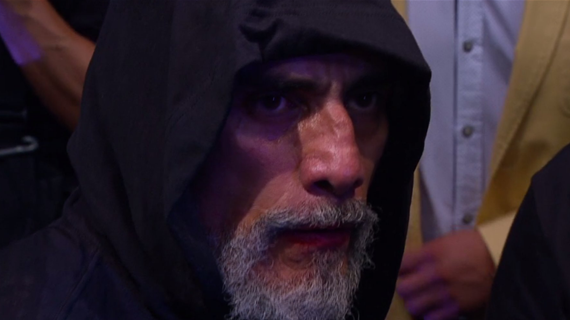 The Assassin. – No Contest. They stalled for time until it was time for the craziness to end the show. Robley got the Sleeper but Assassin bumped the ref and broke the hold. DiBiase hit the ring and tried to hit Robley with his loaded glove; Robely avoided the shot and loaded up his forearm pad and swung it at DiBiase, but Teddy hid behind the Assassin, who ate the loaded pad. DiBiase ran away and Robley stood tall in the ring. Boyd & Watts signed off from the desk and they must have been pushed for time because they didn’t even hype anything for next week and just thanked all the fans for watching. This was far from the best episode of Mid-South, but there were enough good things on the show to make it at least enjoyable. The JYD/DiBiase story is still a strong undercurrent, but we have to wait and see what happens as JYD is refusing to wrestle on TV unless it is against DiBiase and DiBiase is refusing to wrestle the Dog at all. 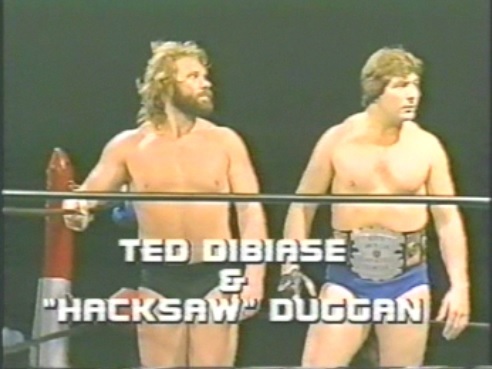 Seeing DiBiase & Duggan forming their heel team was pretty noteworthy, as they would go on to be the top heel faction for the next year-or so. Plus, Watts & Ernie Ladd did a wonderful job of getting Mike Sharpe over to a level he had never been before by laying out the hated Skandor Akbar two weeks in a row. Overall, a solid show but nothing you need to go out of your way to see.